We can make any type of custom trophy! 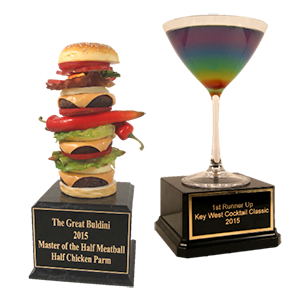 Looking for a custom food or drink trophy? We can turn your favorite food or beverage into any type of award! Perfect for any event or even as a foodie gift! Whether you are looking for a classy marble or wood plaque, a custom employee of the month plaque, or a funny trophy for your boss - we can custom make any corporate award! Big or small, you can customize your dream sports trophy with Far Out Awards! 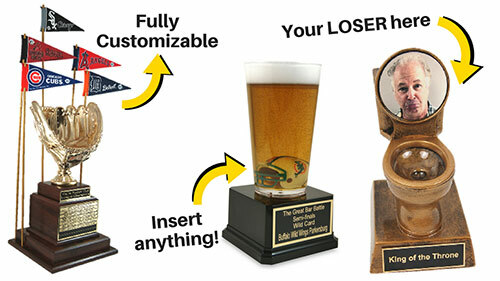 Perfect for fantasy football or your fun sports league, we can turn anything into a sports trophy! Can't find the perfect trophy for your event, business, or contest - we can make a custom award our of anything! No matter how crazy, just ask and we'll build it! Far Out Awards in Action! FABULOUS!!!!!! You all are sooooo creative. I will definitely be ordering again in the future!!! Thank you for making this possible, you are awesome! Thanks so much for the AWESOME trophies! Everyone could not believe how real they all looked - they kept touching it thinking it was real. Can't wait until our other cooking contests we have, so we can order more trophies from Far Out Awards! We are so happy with the our trophy and you should have seen the look on the awardees faces when we presented them! Lindsey was a dream to work with and we look forward to a great partnership for many years to come! I can't tell you how impressed I am with this trophy! Usually items don't look quite as good when you get them compared to the pictures. In this case I would say it looks better than the photo! The customer service was excellent and worked with me to get me what I wanted. Will certainly use them again. At Far Out Awards, our mission is to provide our customers with the highest quality and most unique trophies on the planet. 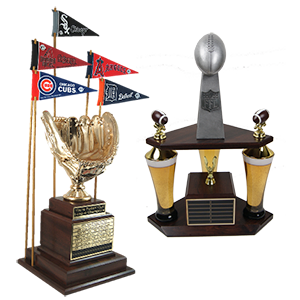 We specialize in custom trophies that don’t look like your average little league award. Our main categories of awards are food and drink trophies, corporate recognition awards, sports awards and fantasy sports trophies, as well Far Out Awards, which are a collection of the coolest and funniest trophies imaginable! 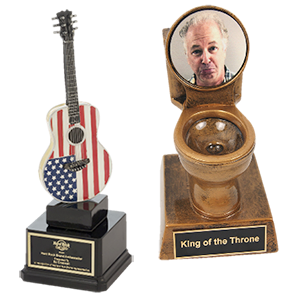 We have everything from cupcake trophies to wine trophies, corporate recognition plaques to silly employee awards, and ping pong trophies to the most ridiculous fantasy football trophies. 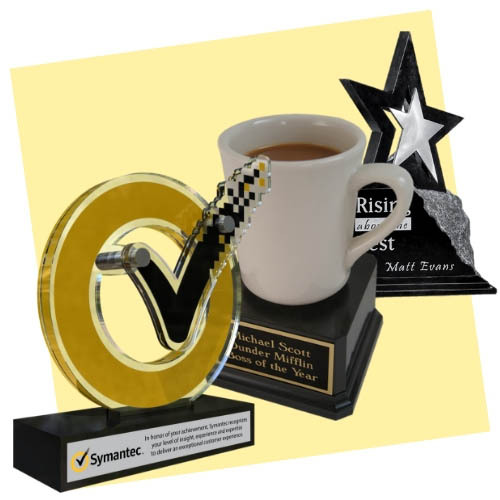 If you don’t find the perfect award for your office, contest, or event – check out our custom trophies page to learn more about how we can custom make the trophy of your dreams! If you are looking for a cook-off trophy, you won’t find a better cooking trophy anywhere other than Far Out Awards. 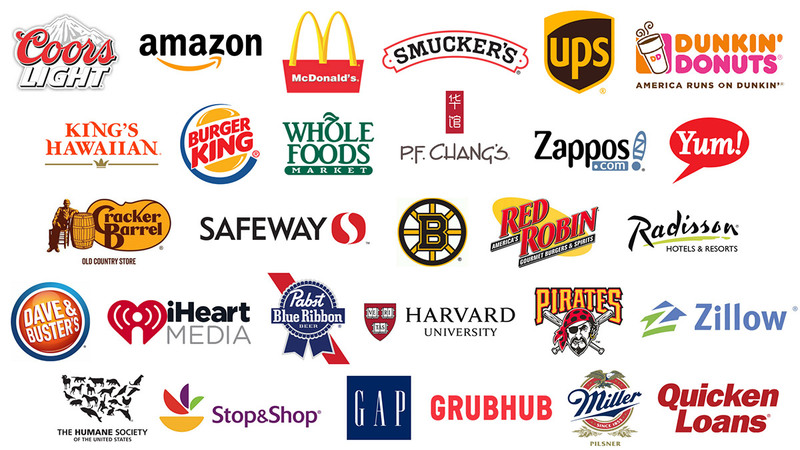 We have every food or drink item imaginable and if you don’t see what you are looking for – we can custom make it! 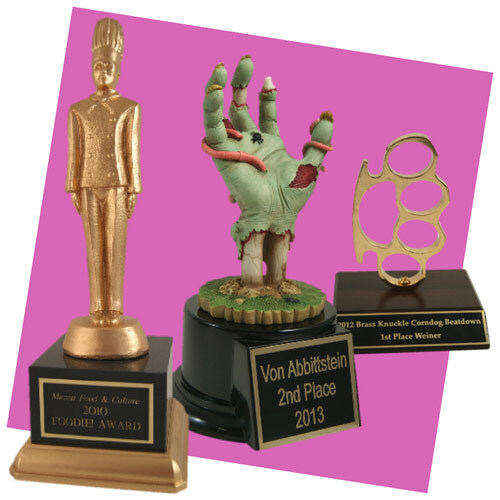 Anything from bacon trophies to cupcake trophies, even beer pong trophies – we have it all! These awards are not only perfect for cook-offs, culinary events, and eating contests, but they make fun gifts or even gag employee awards. 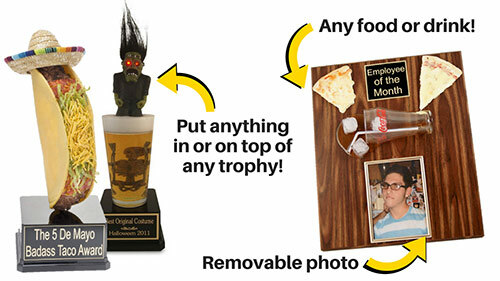 If you are looking for an employee of the month plaque for your bar or restaurant – why not get one with realistic beer, hamburger, hotdog, or whatever food you sell right on it! Don’t buy another boring trophy or corporate award. Our fun trophies will be the life of the party and will make any event a memorable one. Don’t buy another cheap sports trophy that looks like a pathetic little league trophy. Sports trophies don’t need to be lame and boring any more! At Far Out Awards we have the best and most unique sports trophies anywhere. Fantasy sports trophies elsewhere just don’t compare to our custom fantasy trophies. We have the coolest and most unusual fantasy trophies, plus can customize any special award just for your fantasy league. 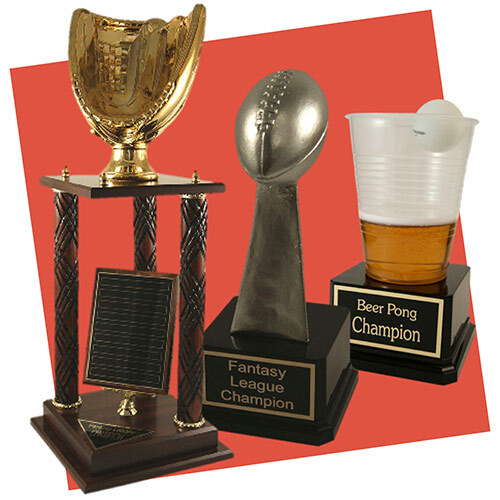 From football trophies, baseball awards, and basketball trophies - we even have beer pong trophies, the best golf trophies, fishing trophies, and even a hilarious set of loser trophies, which are perfect as a last place award for any fantasy league or sporting event. Throwing a fun event or holiday party? Our Far Out section of trophies has the perfect award for any occasion. Anything from a spooky Halloween trophy to a pug trophy, even a coffee and donut handcuffed together, which is the perfect police trophy or police gift. We don’t just offer the most fun Halloween awards – we have Christmas Trophies, Cinco de Mayo trophies, Easter trophies, and so much more! A turkey trophy perfect for a Thanksgiving event or even a green beer trophy for St. Patrick’s Day, you’ll be amazed by our huge selection of humorous and weird trophies and awards. Your employee’s work hard and the best way to show your appreciation is a fun office award to recognize and thank them. We have everything from marble corporate plaques to hilarious and weird work awards. 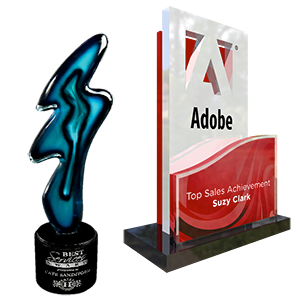 Since we specialize in custom trophies, we can make the perfect trophy for any business, team, or employee. 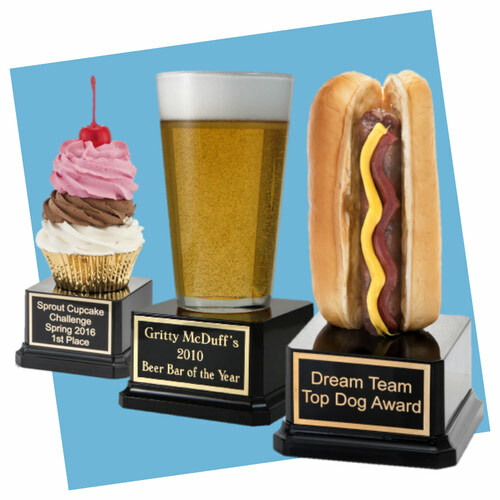 Motivate your sales team with a gag trophy that will be the most coveted thing in the office or create a fun working environment by putting on a cooking contest or karaoke event. 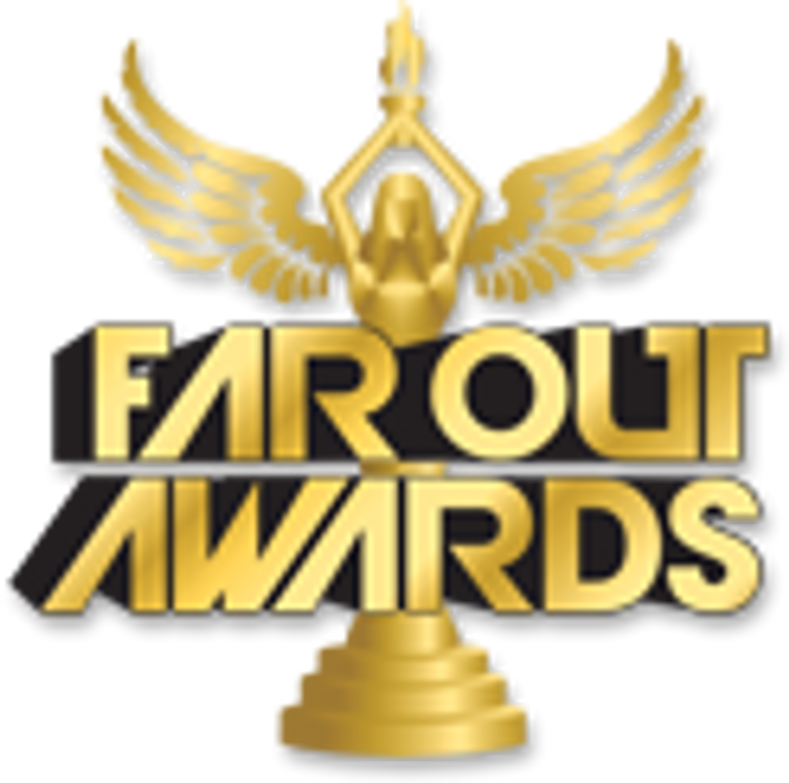 Your staff will be grinning from ear to ear when you bust out a custom Far Out Award! Our coffee trophy is perfect as a boss award or even as a gift for the biggest coffee lover on your team. Or maybe one employee always brings donuts for the whole team – show your thanks with a cute donut trophy. Let your imagination run wild and check out all our corporate trophies.